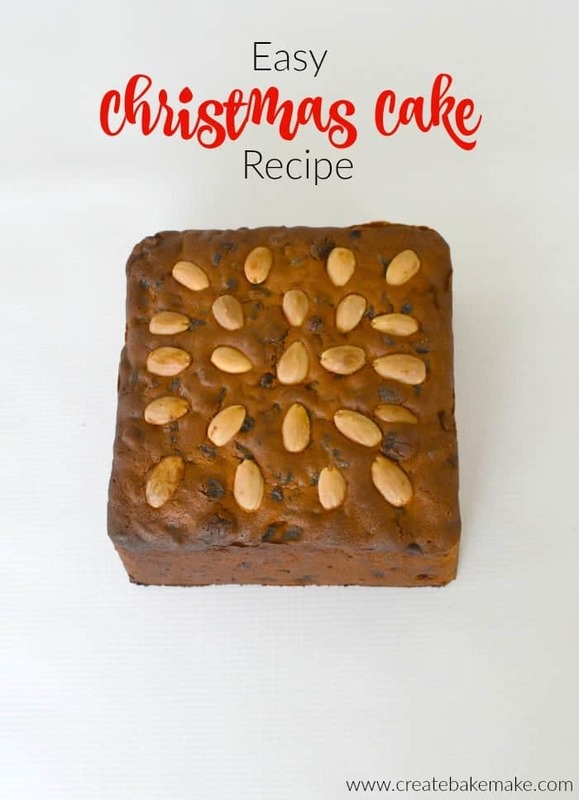 I’ve been using this easy Christmas Cake recipe my Mum gave me for over five years now and it’s hands down the BEST Christmas Cake recipe you will ever try! I’d always been a little intimidated when it came to making Christmas Cakes, I think it was a combination of so many ingredients and the length of time these cakes can take to bake. However this Christmas Cake recipe changed all of that and each year I make a minimum of six of these little gems to give to family and friends. If I’m feeling super organised I start making my Christmas Cakes around the end of October and then wrap them in baking paper and foil and store in a dark cupboard until Christmas. 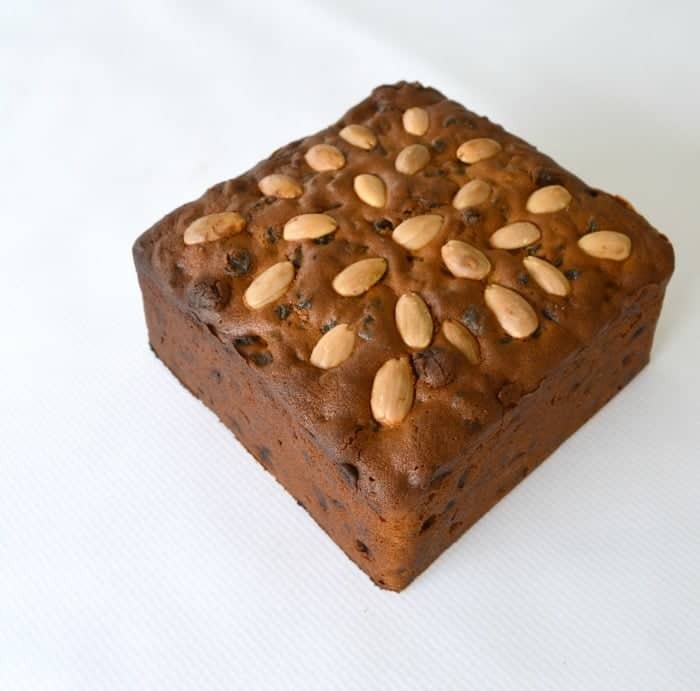 The advantages of doing this is not only do I feel calmer in the lead up to Christmas, but the flavour in this cake continues to develop after it has been made. 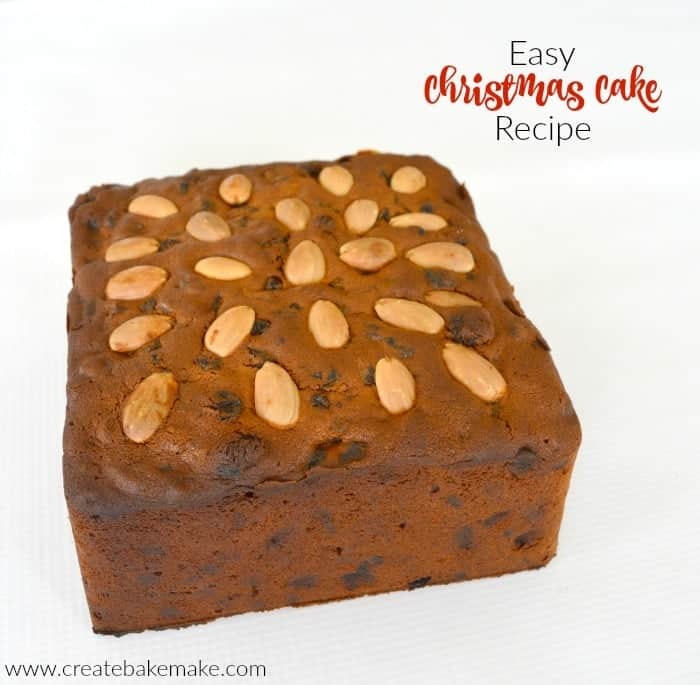 However don’t be alarmed if you haven’t started making Christmas Cakes this year, this cake still tastes amazing when cooked and eaten within a couple of days. Place the mixed fruit, chopped almonds and sherry into a container and give it a good stir to ensure all the fruit and almonds are coated with sherry. Place a lid on the container and leave for 24 hours. When you are ready to make your Christmas cake, line the base and sides of 2 x 15cm cake tins with baking paper and preheat your oven to 160 degrees. Sift the flours and spices together into a bowl and set aside until needed. Place the softened butter and brown sugar into the bowl of an electric mixer and mix for 5 minutes or until the mixture is light and fluffy. Add the strawberry jam and vanilla extract and mix for a minute to combine. Add the eggs one at a time making sure you mix each egg in well before adding the next. If your mixture starts to split, add a spoonful of your sifted flours to it. With your mixer on a very low speed (or alternatively you can do this step by hand) add the fruit and flour mixture alternatively and mix until combined. Pour the mixture into your prepared tins and lightly smooth the surface. I like to create a small indent in the centre of the cake (no more than 5mm) to ensure a flat surface. You can also decorate your cake with almonds at the point if you wish. Place your cakes in the oven and set the time for 1 1/4 hours. When the timer goes off, place a piece of foil over the tops of your cakes to prevent them from over browning. Test your cakes and cook for a further 20 minutes or until soft crumbs appear when testing with a skewer. Remove your Christmas cakes from the oven and allow them to cool completely in the tin, simply wrap them in a tea towel. Once the cakes are completely cool, cut and enjoy! Place the self raising flour, flour and spices into your Thermomix and blitz on turbo 2/3 times to sift and combine. Transfer to a separate bowl and set aside until needed.Place the butter into the Thermomix and blitz on speed 7 for 30 seconds to cream. Scrape down the sides of your Thermomix bowl and blitz again for 10 seconds. Add the brown sugar to your Thermomix bowl and mix on Speed 7 for 30 seconds. Scrape down the sides of your bowl and add the vanilla extract and strawberry jam and mix on speed 7 for a further 30 seconds. Add the eggs and a tablespoon of flour one at a time into your Thermomix bowl and beat for 5 seconds on speed 5 each time. Add the remaining flour to your Thermomix bowl and mix on speed 4 for 15 seconds to combine. Add the soaked Mixed Fruit and gently fold through using your spatula. Remove your Christmas cakes from the oven and allow them to cool completely in the tin, simply wrap them in a tea towel.Once the cakes are completely cool, cut and enjoy! Create a small indent in the top of your cake to ensure it rises evenly and has a flat surface. Check on your cake regularly (through the oven door – don’t open it!) and if you feel it’s browning too much, place a piece of foil over the top of your cake earlier. If storing your Christmas Cake, you can use the baking paper from the tin to wrap it and then cover it with foil. This also makes one large cake, I use a 20cm square tin and the cooking time is around 2 1/2 -3 hours. Do you make Christmas Cakes each year too? That looks so easy! 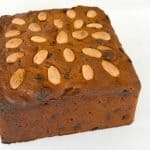 I have never made a Christmas cake, not sure why, though I do love the Christmas pudding we make as a family each year. I’ll be sure to give this cake a try! Yum! Christmas cake was always one of my favourite things and I used to make one every year. Lately though I’ve been making panforte, which is a bit less cake but still the fruit and nuts. I love panforte, it’s been on my Christmas baking wish list for years! That looks awesome. I am glad it is a recipe handed down from your mum. That’s what cooking should be about, especially at Christmas time. I used to make Christmas cakes as did my late mum. I’ve made complicated ones and boiled fruit cake versions. I did enjoy eating some of them but more than anything, I liked giving them away. Enjoy your giveaways too! Merry Christmas eating. YUM! I love Christmas cake and this looks divine. I haven’t done a Christmas cake this year. I meant to, but just ran out of time. Usually I soak all the fruit. Maybe I could try this instead. I’ve never made a fruit cake at Christmas as I always thought it was too difficult and time consuming, but I think I could actually make this one! Wow Lauren, this Christmas cake looks perfect – even better than the store bought ones! You’ve inspired me to give these a try! This sounds like such a delicious cake – and manageable, which I’m all about this time of year 🙂 I think a weekend baking project is in my future! Oh I hope you enjoy it! Ooh yum! These really are simple! Love the idea of giving them as gifts too – especially because they last so long! I know, it’s such an easy Christmas gift to put together! This looks great, I’ve yet to make a Christmas cake. Hi This cake looks yummy, I am goimg to make it but I only have large tins one big round and large square ones approx 22 to 25 cms, will this work and do i need to increase cooking time for that? Thanks. I have a quick question for you. I make all your recipes gluten free and have had great success. The key to gf cooking is measuring by weight. Is there a trick to converting cup measurements to weight (I really hope this isn’t a dumb question)? Thanks Lauren. They came out beautifully. And, my husband, who doesn’t usually like Christmas cake, loved it. How does the cake not go mouldy when left in the cupboard for so long? I’m just wanting it to last five days…will it really be ok just wrapped and left in the cupboard? Thanks so much for the advice and recipe. Hi Kirstie, you can make these quite awhile in advance, I made my first batch for Christmas back in October. I wrap them in the baking paper I use to bake them and then cover in foil and store in the pantry. They flavour actually improves the longer you leave it. Hi Courtney, thanks for your comment. Hmm, possibly it was a little over cooked?